"THE RODELU HOSPITAL" is a photo report which I began working on in the beginning of 2004, and which I have continued to develop this year, in the Hospital de Clinicas "Dr. Manuel Quintela". In the beginning, my idea was to continue to address the topic of urban and social deterioration in the city of Montevideo, potentially through themes such as public health, university education, or the emmigration of Uruguayans overseas. Once I decided to explore the theme of public health, I found myself working in the Hospital de Clinicas, primarily because it allowed me to connect the topic of public health with the topic of university education. Secondly, I was drawn to this site because it was one of the hospitals so emblematic of Uruguay and because its services were basically contained within one building. The lack of hygiene, the deterioration of the building itself, and the shortage of medical equipment, are all problems well known by any patient who has been admitted. Moreover, these problems have intensified since the year 2002 due to the severe economic crisis suffered by Uruguay. This crisis brought about, among other things, the closing of several private health facilities (named "mutualistas") as many people could not afford to pay for private health coverage. All these people were forced to access public health, causing the near collapse of the entire public health system. Moreover, in July 2002, the emergency section of the Hospital de Clinicas had to close its doors, due to lack of financial support. To start with, I visited almost all parts of the hospital in order to familiarise myself with the state of the hospital and the situation of its patients. I was able to observe that the majority of the hospital consisted of either sectors in use, albeit in advanced states of deterioration, or sectors which had been abandoned. In contrast, there were only a few sectors which had a good quality of infrastructure and service (for instance, the National Burns Centre). Therefore, I decided to document that majority part of the hospital which is so symptomatic of the social and urban reality which travels right through the skin of this building. To show that which hurts to see, or perhaps that which we do not want to see: that deteriorating clinic which developed through time. The result of a slow and chronic sickness which this building has agonized. A hospital which is as, or even more, ill than those patients who are attended there. While university authorities and politicians get involved in endless and unbending discussions about the need to bring the Hospital de Clinicas back to life, or the need to create a new model for attending to public health needs, the hospital itself continues to debate between life and death, waiting for a convalescence which may never arrive. Finally, I would like to thank the medical students, doctors and hospital staff members who made an important contribution to the realisation of this piece of work. THE RODELU JAIL is a piece of work which I developed in 2003 in the ex-jail Miguelete. The topic of jails was not strange to me as I had worked for several years (until 2003) in the Asesoria Juridica de la Direccion de Carceles (the legal consultancy office for national prison management), and was up to date with different aspects of the reality of the prison system. In the beginning I came up with the idea of carrying out an internal documentation of Uruguayan prisons; however, for differing reasons, I was unable to do so. At the end of 2002 the authorities of the national prison management requested that I digitally restore some unpublished photographs of the Miguelete jail (taken long before its abandonment) which had been preserved in an old album. These historical photographs, of such a vastly changed reality, came to form part of an exhibition which celebrated the national prison management office's yearly anniversary and which also included various handmade arts and crafts which had been created by inmates. The exhibition was also attended and supported by various highly ranked policemen and politicians intent on showing a particular image of prison reality. After this time, I began developing a personal project with the aim of documenting, photographically, the current situation of the abandoned Miguelete jail, focusing on the deterioration of this state institution. This project is therefore, primarily, an attempt to document, as closely as possible (given certain limitations), what was until recently a prominent Uruguayan jail, and the reality of this jail today. Secondly, this project documents the growing urban deterioration which has occurred in Montevideo in the last several decades, showing the deterioration caused by the passing of time, the waiting, along with the remains of those who once lived in this jail, and the words and thoughts which still inhabit these forsaken spaces. And finally, this project presents, beyond a literal anecdote, a metaphor of my vision of a country, Uruguay, which has been abandoned or, in the best of cases, whose inhabitants have managed to escape. My thanks go to the administrative management of the Ministry of Education and Culture, who permited my access to the Miguelete prison. I also thank all those who, in one form or another, collaborated in the realisation of this piece of work. "THE RODELU FAMILY" is the result of a project from a workshop on Photo-journalism at the Photo Club of Uruguay done in 2002. This project meant a turning point from my previous work, first because the themes that I had been working on, that were more abstract at the time (directly related to architecture). I also used a different way to tell a story, and this work needed human involvement to be completed. Since the beginning of this workshop, the idea to develop the theme of urban and social deterioration that is taking place in Montevideo was forming in my head. Then I decided to focus on one specific quarter: Goes, which was familiar to me because I spent part of my early growing-up years there. The Goes quarter was a typical middle class neighborhood of the first half of the 20th century. In that time, Uruguay was known as" The Switzerland of the Americas", because of its high standard of living. A country that welcomed European immigrants -mostly from Spain- looking for a better life, fleeing civil war and economic hardship who established their families in the prosperous Uruguay of those years. In the last 30 or 40 years Goes has been one of the neighborhoods that has suffered the most changes in the Uruguayan society. Houses and businesses have slowly decayed or closed down, and the standard of living has fallen. People wonder what happened on the remains of the once thriving neighborhood. However, safety was an issue, due to the economic crisis that affected Uruguay and the region during 2002. It was difficult to carry around expensive photo equipment in certain areas. Then I decided to focus on the interior of a house that reflects what is taking place on the outside. Social issues have a correlation in the home environment that always attracted me. The relations between the public and the private environments drove me to choose this topic. This work deals with the relentless effect time has on a family, the exhaustion, the deterioration and the solitude in a house that gradually was inhabited by the absences. My relationship with this family goes back 30 years. Thanks to Jose-the only remaining member-, I was able to do this work. It was quite hard for him to reveal such intimate things through photographs. This is, to an extent, also an autobiographical work because it drove me to dig into my own family history. The real interest lies not in documenting the life of a particular character but on portraying what once was and what remains of the Uruguayan family. Finally I would like to thank José for allowing me to get close to his family's soul and because of this, have a better understanding of my own family and all the friends that helped in one way or another to complete this work. 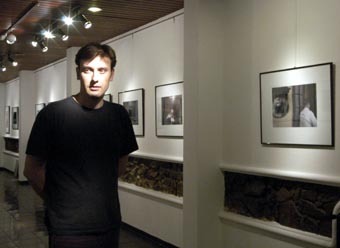 Daniel Machado in your exhibition in the Goethe Institute.